Havana (/həˈvænə/; Spanish: La Habana, [la aˈβana] ( listen)) is the capital city, largest city, province, major port, and leading commercial centre of Cuba. The city proper has a population of 2.1 million inhabitants, and it spans a total of 728.26 km2 (281.18 sq mi) – making it the largest city by area, the most populous city, and the third largest metropolitan area in the Caribbean region. The city extends mostly westward and southward from the bay, which is entered through a narrow inlet and which divides into three main harbours: Marimelena, Guanabacoa and Atarés. The sluggish Almendares River traverses the city from south to north, entering the Straits of Florida a few miles west of the bay. 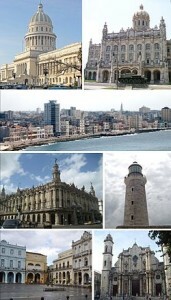 Contemporary Havana can essentially be described as three cities in one: Old Havana, Vedado and the newer suburban districts. The city is the center of the Cuban government, and home to various ministries, headquarters of businesses and over 90 diplomatic offices. The current mayor isMarta Hernández from the Communist Party of Cuba (PCC). In 2009, the city/province had the 3rd highest income in the country.